Basic mattress. Photo is not a direct representation. Our Basic comfy mattresses are great for furnishing rental properties in Mexico, for kids' rooms and for vacation units. 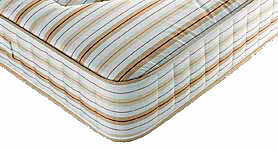 These mattresses do have a good system of springs and they feature anti-bacterial and hypo allergenic fabrics. Fabric colors can vary (beige, light pink, powder blue). Nowhere as comfortable as our Superior or Prestige mattresses, but a very good, basic value.